The first set of pictures were taken on December 6, 1998. It was an unusally warm day, mid 70 degrees. 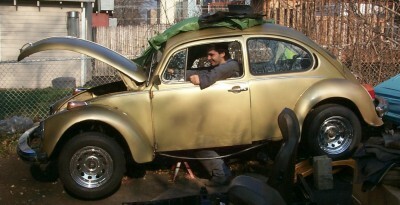 Model and Year: 1974 Volkswagen Beetle, manufactured in Canada. Engine Rear mounted, air-cooled 4 cylinder engine. Push rod, two cylinders on each side. Features: Sun roof. Wider tires and rims. From the back. See the engine inside? Note the wide rims and tires. They weren't put in by Joe, he might actually try get stock rims in the future. 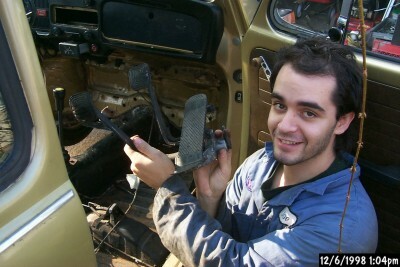 Joe's holding the original replaced part. Note how rusty it is. This part connects the firewall and the chassis. 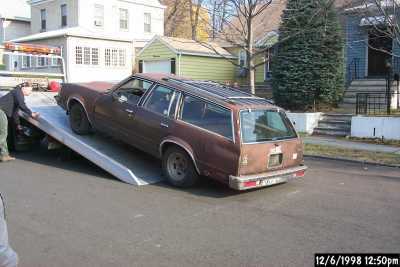 Note that the floor of the driver's side has been taken out. 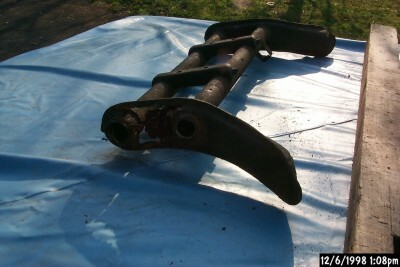 The original front axle. Joe has replaced it with a brand new one. The old one was really rusty, I wouldn't want to be in any car with that axle! The mighty air-cooled engine. 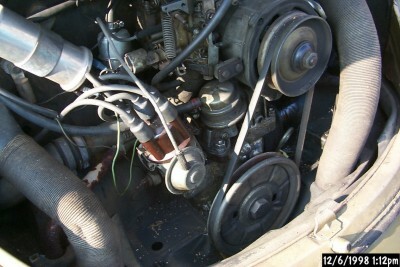 Many parts have been rebuilt/replaced, including the distributor which is fairly new. 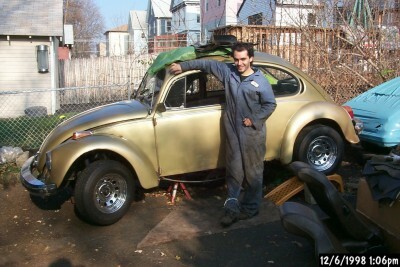 Well, Joe's been working on this car whenever he had free time since last summer, and he planned to get it finished by this winter, but it looks like it may be finished by next summer. But due to the warm weather recently, he was able to work on it more. 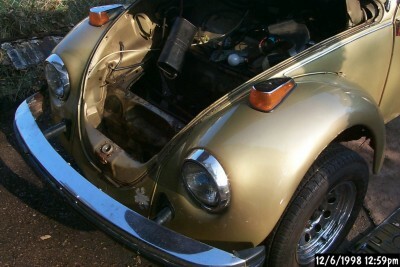 The color of the car was originally red, the previous owner(s) have painted it over as gold as seen in these picture. 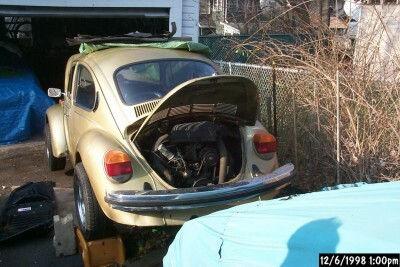 Joe's thinking about painting it back to red, with black dots on the top -- to make it look like a Lady Bug. More body work remains, Joe comments on how the rust condition is pretty bad, and he attributes it to the fact that the car was manufactured and driven in Canada, where road-salt might've had some undesirable effect on the chassis. 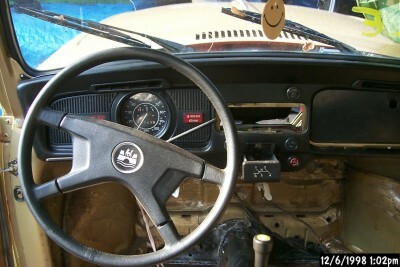 The interior also needs work, I hope to help him out on that next year. 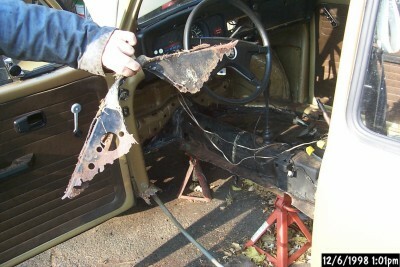 Well, Joe has put in the floor on the driver's side, and at the same time has learned to use the welder. Another option for painting discussed: painting ocean waves, and perhaps a little palm-tree. Last update 2/2004. Copyright s.r.s © 1998 - 2008.